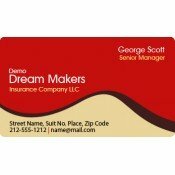 Establish a reliable identity system for your insurance services by involving any of our insurance magnets. These advertising magnets are crafted over popular sizes of rectangle and square magnets as well as other shaped magnets such as heart shaped magnets, house shaped magnets, etc. We offer free full-color printing which allows marketers to build persuasive campaigns with minimum efforts. 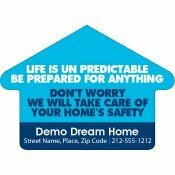 Save on wholesale orders of these best-seller Made in USA magnets. Today, people are eager to insure their homes, cars, health and life which mean there are plenty of business opportunities for insurance services. Most insurance businesses or professionals, gain their leads from the existing clients because this is one of those businesses which grow through referrals. That is why it becomes important for insurance services to build strong relationships with their clients. Today, most of the insurance businesses have embraced online technologies to keep in touch with their clients, but they know the power of personalizing relationships. They understand that it is always important to remain before the eyes of their prospective customers to influence them. This is why promotional magnets are a priority over other promotional items. 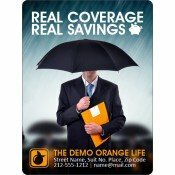 Insurance services, insurance professionals and insurance companies can hone their visibility and business credibility by employing any of these promotional insurance magnets. 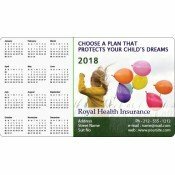 Our customized magnets are offered at cost effective prices which enables all small and big budget marketers to order them in bulk and enjoy high ROI. 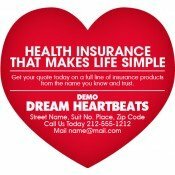 Insurance agents, services or businesses can easily get their contact and brand information imprinted over these personalized magnets in the colors of their choice. They need not worry about set up charges because we offer a free art setup on all our products. Save on free UPS ground shipping anywhere within the contiguous USA. Enjoy free online design proof and unlimited mock-ups on all orders. 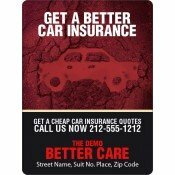 Insurance businesses can avail these popular customizable magnets in bulk for mass events such as business conventions, trade shows, trade conferences, etc. We only offer custom magnets sculpted over the high quality and lightweight material which means these are perfect for bulk mailing. Order them along with suitable envelopes from our collection! To know more about your chances of promotions with these insurance services magnets, feel free to contact us at 855-762-4638 or write to us at info@cmagnets.com.